Good news to all blackberry 10 phone users as the much talked about blackberry 10 OS 10.3.1 has been officially made available for all BB10 Phone users. Before now, we had shared with you a leaked version of the 10.3 Operating System but now, the official version has been made available. The update is said to be made available on devices based on the carrier it runs on. Hence, if it isn’t available on your mobile carrier, just be patient. As at when publishing this, I have received the update. Although I wasn’t informed via a push up message, i had to force it out. If you haven’t gotten a notification of the update, you can try force-pushing it. As usual the update comes with new refreshed look and feel alongside new awesome features. Some of these new features include the Blackberry blend. The blackberry blend just like the newly introduced whatsapp web, allows you view your blackberry messenger (BBM) and content on your computer and tablet device. The Amazon app store is also included in the update. With the amazon app store, you can get easy access to popular apps and games. Enhancements were also said to be worked upon in terms of battery as there will be a boast of battery efficiency by up-to 15%. Feature enhancements were also introduced on the blackberry hub, calendar, camera, multimedia and more. Just before your make an update to your device, it is advisable you make a backup of your blackberry 10 phone. To do this, it’s required that you use the blackberry link software which should be downloaded and installed on your computer. 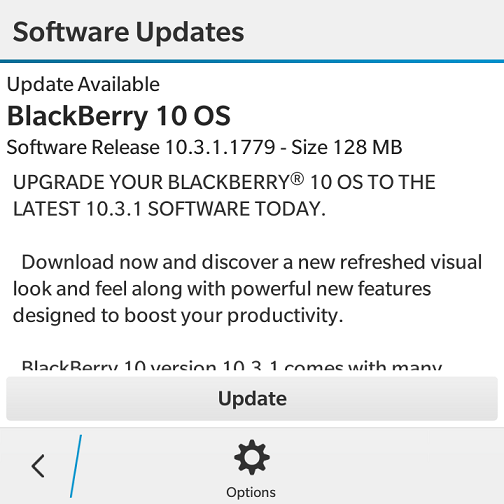 Navigate to settings on your blackberry 10 phone, scroll down to Software updates. Tap on it and you should see the notification of the new update. 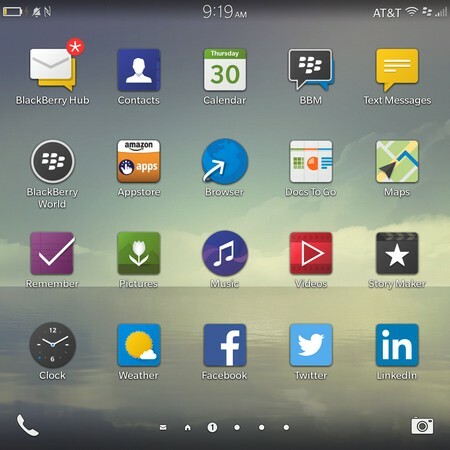 Blackberry 10 OS – 10.3.1563. The size of the update is about 1001MB (1GB). If you use a blackberry 10 phone like the blackberry q5, q10, q20 (classic), z10, z3, passport, etc, it may interest you to know that there is a version 10.3 leaked currently out on the Internet. It’s a leaked version and gives you the ability to experience blackberry 10.3 OS before it is officially released for the BB10 devices. As expected, the OS comes with some adjustments, bug fixes and enhancement (usual suspect). 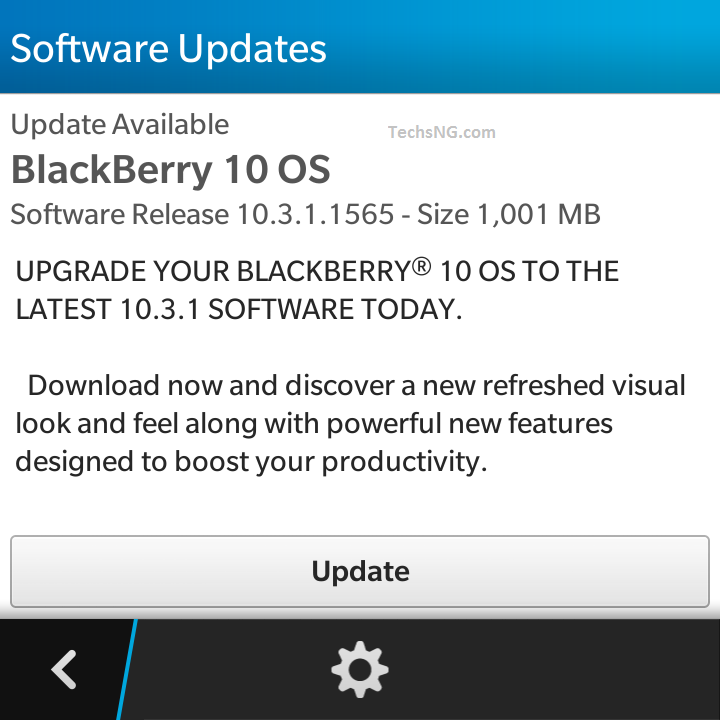 The BB OS 10.3 is said to also improve battery life span and some android features are being introduced to the OS. If you are currently using a blackberry 10 phone, you should notice that the menu icons are placed 4 by 4. But with the new update, it’s placed 5 by 5 with a more sleek design. Some well-known android gestures was also introduced like the lift to wake, flip to mute, flip to save power amongst others. Without much talk, you can take a ride of the OS on your BB10 smartphone pending when the official OS is released. You can download from the links here. Please be aware that blackberry q5 and blackberry 10 use same file, while blackberry 10 and blackberry classic use the installation file. The size of the leaked OS is over 1GB and lesser than 2GB. Just be sure your current data balance can take that before commencing download of the BB10 10.3 OS. Blackberry seems to be doing a lot of OS updates for blackberry 10 phones and that feels pretty good. Couple of weeks back, A new Blackberry 10.3.1 OS was officially rolled out on blackberry 10 phones. Although the update brought a whole new look and feel to blackberry 10 Devices, it however, came with bugs which vary based on bb10 devices. Now, another minor update is currently rolling out and it’s the OS version 10.3.1.1779. On my blackberry 10 phone, the update size is just about 128MB but this might vary based on the kind of blackberry 10 phone you use. As at when posting this, we are not quite sure what specifically, the update fixes or introduces but we are quite sure it’s intended to fix the bugs that came with the OS 10.3.1. Besides, being able to download and install android apps works on BB10. So also, being able to use two whatsapp apps on the OS. Please remember that you may need to connect to a WiFi network in other for the update to fully commence as your mobile network might not work. You can however, choose to use the blackberry link software in updating your phone’s OS. Have you updated your blackberry 10 OS to this latest version? If yes, please share with us your thoughts and the specific device you use via the comment form. I received the update on my z10 but there is a notification that the update is too large for my glo,that I should use wifi. What do I do please? Shams, use wifi connection as requested. I received the update but there is a notification that the update is too large for my glo,that I should use wifi. What do I do please? Try using the blackberry link software in updating. That should work fine for you. My BlackBerry link says my OS is latest available at 10.2.1. It doesn’t seem to recognize that 10.3 is actually available. How can I force Blackberry Link to update my Q5 to 10.3? Thanks. I’m using the official BlackBerry and I’ve checked the software update under settings but it still shows me .2941. What could be wrong? Then make sure of the Blackberry Link software. I’m in Nigeria using Glo network. I’m currently on OS 10.2.1.537 Model – Z10 STL100-1.The only update notification I’m getting is to OS 10.2.1.2941. I’ve been getting this notification for months but was waiting for OS 10.3 so I can update at once. Do I have to update to .2941 first? Or is there a way I can get the update? Thanks. Am also using glo and used to be in same position as you. Just navigate to software update under settings and you should get notified of the new update. If your blackberry is from another carrier like AT&T, Orange, Sprint, etc, the update is rolled out gradually but if using the official Blackberry, you should get the update. Delete every unnecessary app. Apps could be taking up such storage. Blackberry Repairer is the best service centre in UK for all the models of blackberry including Blackberry software configuration service. Just follow the instructions above by navigate to software updates on the device. HTC Repairer is the top most repairing centre in UK. We offer a best service for all our HTC customers and carrying the top performance position constantly.